If you are looking for Custom, Hand made, Native American style flutes, you have come to the right place! Welcome to Wind Dancer Studios, specializing in hand carved, Native American style flutes by renowned Artist and Master Flute Maker, Roger McGee. McGee has been a sculptor and Artist for over 35 years. One of his many talents is making Native American style flutes that are played and cherished by people all over the world including professional flute players such as Carlos Nakai, Peter Phippen and John Twohawks. Each Native American style Flute created at Wind Dancer Studios is custom crafted one at a time using only hand tools to shape the wood. Finger and tuning holes are burned into the wood by using a hot metal rod. 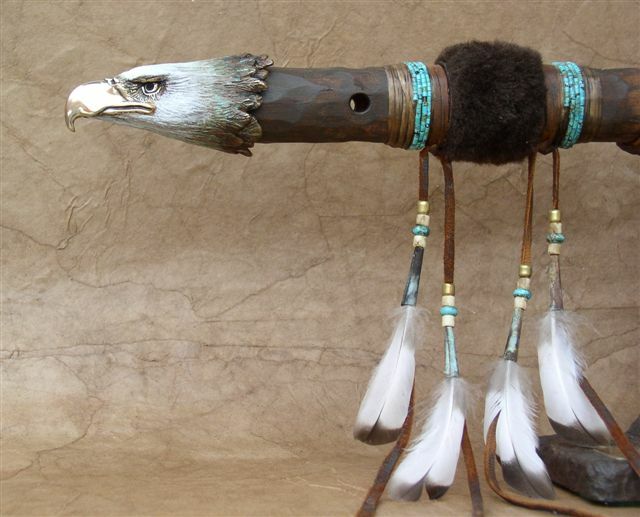 McGee works with inlaid shells, buffalo teeth, carved totems, feathers, beads, paint, to create these old style flutes! McGee's diverse talents are shown in the exquisite nature of his bronze sculpture. His ability to capture the life and beauty of his subjects is a rare talent.
" According to the Indian Arts and Crafts Act of 1990, I must make clear that I am not affiliated with any North American Tribe. The flutes on my web site are " Native American Style Flutes " and in no way refers to my heritage "